J.C. Penney's disastrous sales plunge under CEO Ron Johnson has been widely attributed to his "fair and square" pricing strategy, which did away with the vast majority of its sales and coupons. But many shoppers say they've ditched the the retailer for an entirely different reason: They just don't like the clothes anymore. Over the past few weeks, we've received dozens of emails from readers identifying themselves as former J.C. Penney (JCP) customers. And the vast majority of them said its new apparel offerings were the biggest reason they've stopped shopping there. "I have been a customer of JCP for over 20 years. The only reason I still go there is because of the salon," writes Jacqueline Price. "I do not buy any merchandise in this store since they did away with all the lines I loved, such as St John's Bay [and] Gloria Vanderbilt." Another reader, Kris Christensen, echoes the sentiment that the retailer is ditching the clothes she loves in favor of new collections that don't appeal to her. "J.C. Penney was the last store to sell clothes for women that were reasonably priced and well made," writes Christensen. "If emptying out the stores of decent clothing and stocking them with the cheapest made rags possible is the great change he was talking about, he's finding out he was wrong." We're guessing Johnson would bristle at the suggestion that J.C. Penney's new apparel collections are "the cheapest made rags possible." If anything, he's attempted to upscale the retailer by bringing in well-known brands like Martha Stewart Living and by dedicating floorspace to boutiques featuring the likes of Levi's and Izod. But those fashion-forward brands apparently don't appeal to the disgruntled shoppers who wrote to us. Interestingly, most of the readers who emailed DailyFinance are older; and these customers feel the new J.C. Penney is abandoning their demographic. "Penney's is trying to attract a younger, hipper customer, but frankly its loyal customer base is older, heading into elderly," writes Katherine Troyer. "The company has dropped many of the brands and clothing styles favored by older people on a budget." Another reader identified herself as a senior citizen and bemoaned that J.C. Penney "threw their loyal, mostly older customers out." Yet another ex-customer wrote in to complain that the retailer is now dominated by "edgy styles only a 16-year-old can wear." She added that she'd taken her business to Sears (SHLD) and Kohl's (KSS). We did get a few favorable opinions on the new apparel. "I'm 56 and love the clothes," writes Meredith Porterfield. "They are hip, edgy and very affordable." Meanwhile, the new direction has also met with approval in fashion-forward circles: Both Esquire and GQ gave positive coverage to the arrival of style icon Nick Wooster as new head of menswear. And on a personal note, I checked out my local J.C. Penney recently and found that for the first time in my life, it looks like a store where I'd actually go shopping. The Levi's boutique presented an attractive array of denim choices, and I was impressed by the new shirts and ties from Stafford. But then, I'm 27, so it's to be expected that I would dig the new-look JCP. Unfortunately, the retailer's plummeting sales suggest that it's losing older customers like Kris and Jacqueline a lot faster than it's winning over younger ones like me. Menswear site Dappered recently used an interesting analogy to make this very point, floating the hypothetical situation of Miller ditching its usual beer in favor of IPAs and stouts brewed by world-renowned craft brewers. In this hypothetical example, the loyal Miller fans would leave in droves, offended by the fancy new beer and by the suggestion that the beer they used to love was low-quality swill. And no matter how many new drinkers Miller gained from the switch, it wouldn't be enough to offset the loss of their former customer base. "Meanwhile, there's a slight uptick in new customers giving the reworked line of beers a try ... but it's scattered support," writes the author. "Most of these potential customers already have allegiances to other breweries." 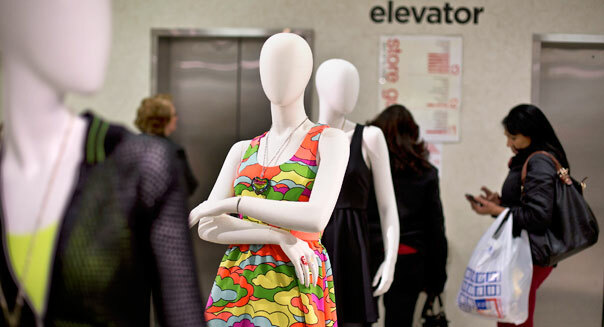 In trying to transform J.C. Penney into the Apple Store of apparel, Johnson has undoubtedly won over some new shoppers. But he apparently didn't realize how many of his established customers he would lose in the process. In his latest earnings call, Johnson acknowledged that his radical new pricing strategy was a "big mistake," and he's already brought back sales and coupons. But a coupon isn't enough to get people to buy clothes they don't want. Christine White tells us that she stopped going to J.C. Penney because she wasn't impressed by its new merchandise, but that she decided to give it another chance this past weekend after getting a couple of coupons online. "I went there again on Saturday. I had received two Internet coupons and decided to try and find something," she tells us. "After about 45 minutes, I was only able to use one of the coupons because I couldn't find anything I liked enough to spend money on." "The first and most encouraging thing to me is I am completely convinced that our transformation is on track. We are making extraordinary progress in everything we're doing." "In haircuts, it's pretty incredible. Today we will cut on our tenth day of this effort to help Americans look better, help the kids look better. We'll do our 500,000th haircut, free haircut. And today customers will book their millionth appointment during the month of August to get a haircut. "We're reducing the money on television. We'll still run television and we're investing heavily in the traditional traffic driving median, so be in the newspaper and we think that's going to be good." "We're going to go paperless. ... Imagine a retail store without any paper except the signs, because everything will be done digitally through iPods and iPads and those are our priorities and those are all priorities within the next 12 to 18 months." "Well, for the first 10 days with our new marketing, our traffic is down 7% to last year, which is a dramatic improvement." "We're inspired by Selfridges. Selfridges is the leading department store in the world. You ask any retailer what's the number one department store? They will all say Selfridges." "It's a place to refresh and we're going to have coffee bars and juice bars and place to get food, that's 25-square feet of space, but by putting out a few tables that have no cost, where we used to have cash wraps, no one has to leave the store if they want to refresh, they can grab a cup of coffee while someone shops and continue to stay in the store and continue to shop." "We've rolled out Wi-Fi, but we really don't have a lot of use for it." "What happens in a big mall of a 1 million square feet, about 600,000 square feet goes to the anchors and the common area which leaves about 400,000 square feet for the stores and the stores average 3,000 to 4,000 square feet. So, you run the math, you have about 100 to 120 stores in a typical mall we're in. We'll have just as many shops with inside JCPenney and that's what we call it a specialty department store. It's like a mall within a mall. "Yeah, we're very anxious to communicate our pricing to our customer and we have failed at that, right? They were confused. Now, we have a pricing strategy that they understand. We have done focused groups around the country over the last 30 days with our new pricing strategy and they all say, we get it, whereas before, they were confused." "At Apple our stores were busy when we only had Macs. Then we added the iPod; they got busier. We added the iPhone; they got busier yet. We added the iPad, and they got busier. The same thing will happen here. Next spring it's Joe Fresh, Martha Stewart, all our new partners. It will be just like Apple: boom, boom, boom." As analyst Bill Dreher of Newedge USA told Johnson on the call, "I want to applaud you for creating one of the most exciting stories in retail write-down." AARP The Magazine Reveals 2012 List Of Top Ten Places To Live...on $100 A Day!